If you happen to be a rodent fan, you may find the three-foot long, thirty-pound Pacarana interesting. Don’t expect him to reveal a lot about himself though! The Pacarana is a very secretive animal. No one was even aware of its existence until 1873. The Pacarana inhabits central South America. The hills and valleys of the Andes Mountains are the preferred habitat for this rare creature. Little is truly known about the Pacarana and its habitat. The lack of knowledge includes vital information to its habitat, which may lead researches in the wrong direction when looking for Pacaranas to study. Maybe they’re not as rare as many think. We may just be looking in the wrong places for them. 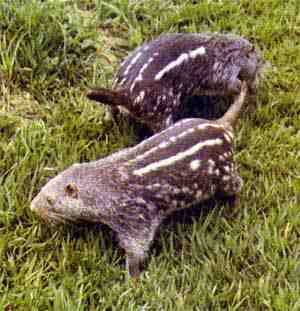 The Pacarana is a rodent with a dark brown upper body, two white stripes along its back, and white spots down each side. Its ears are distinctively small and curved. A deep cleft can be seen on its upper lip, and its face is accented with long gray whiskers. Fruits, leaves and plant stems are the main staples of the Pacarana’s diet. The food is held between the front paws of the Pacarana who sits on his hind legs to enjoy his dinner. Within a few days of birth, the tiny Pacarana babies (often twins) are ready to explore their environment. It takes the mother two hundred twenty-eight to two hundred eighty-three days to give birth to these curious little creatures. The fact that females cry to attract mating partners it one of the few known facts about the mating rituals of the Pacarana. Pacaranas are considered threatened animals that are possibly on the verge of being classified as endangered. It is thought that the destruction of the forests has little impact on the Pacarana, but that its greatest enemy is human. Even though the species is rare, natives still hunt them for food. They communicate with foot stomps, chattering teeth, whines, songs and hisses. E-mail to add your Pacarana related website.